Unalaska’s mayor will face a recall election in March. Frank Kelty has been accused of backroom dealings regarding the city dock — accusations he has repeatedly denied. In an investigation, KUCB has been unable to find any evidence of wrongdoing. Those in favor of the recall say they have other concerns about Kelty’s leadership. 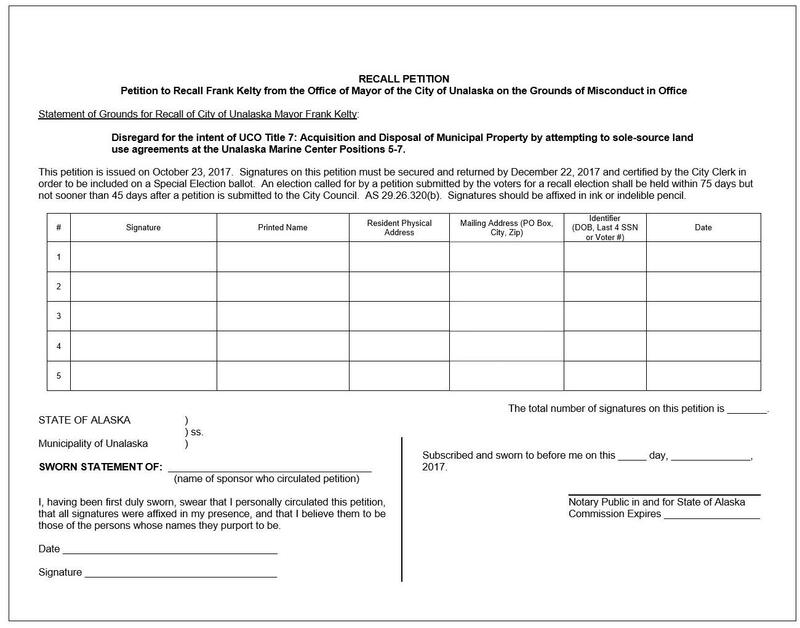 In October 2017, a petition to recall Mayor Frank Kelty was issued with one charge: “attempting to sole-source land use agreements” for the city dock. The petition’s sponsors have accused the mayor of giving one shipping company, Matson, first crack at an agreement that would give it priority mooring at a section of dock. City code requires a public bidding process. But beyond making the allegation, none of the 10 sponsors have offered any proof that the mayor has negotiated illegal deals. A KUCB public information request for Kelty’s emails referencing dock agreements did not reveal any wrongdoing by the mayor. But between Oct. 1, 2016 and Oct. 13, 2017, Kelty did exchange about a dozen emails with Matson representative Marion Davis that mentioned dock agreements. Matson repeatedly pressed Kelty on the issue – asking him to help the company obtain a formal agreement. While Kelty seemed to share Matson’s desire to complete the deal, there is no mention of specific contracts or negotiations in the emails. Kelty denies he was involved in any misconduct. A preferential use agreement is similar to a long-term lease on a house: The city guarantees a company space for its boats to dock. Here’s former city manager Dave Martinson explaining how those agreements benefit Unalaska. Matson had an agreement with the city. But it expired in 2013 due to stalled tariff negotiations. The deal has continued informally since then. In a statement, Matson’s Kenneth Gil says that beyond Unalaska, the company has had preferential use agreements in Kodiak and Anchorage for decades. “In order to provide our reliable weekly service to Unalaska, we need to be able to count on the availability of facilities and plan for the long term,” Gil said. Matson owns the container crane on Unalaska’s dock and provides regular barge service for mail and groceries. Despite those benefits, Unalaska hasn’t opened a public bidding process for dock agreements — at least, not yet. Former city manager Dave Martinson said he wasn’t against those agreements. He just wanted to wait until the city’s major dock renovation was finished. Days before his September resignation, Martinson said multiple companies had expressed interest in dock agreements and that the Ports and Harbor Department was working on a request for proposals. But today, Matson has no such agreement, negotiated by Kelty or anyone else. Kelty says the alleged dock deal isn’t really why people wanted to recall him anyway. He says residents are upset because he beat former mayor Shirley Marquardt and because the city manager resigned controversially. “The only way they could come after me is to go with the recall route, because otherwise the next election for me is in two years,” Kelty said. Petitioner Dee Montier-Burke doesn’t deny that. She voted for Kelty, but now she’s unhappy with his leadership. So even without proof of an illegal deal, she says she’s comfortable moving forward with the recall. When asked by KUCB which part of city code backed up that charge, Veeder was unable to do so. The recall election is scheduled for March 6.